Designed for real estate agents who desire a working knowledge of the application and use of 1031 exchanges to benefit your clients. Learn the basics through intermediate level in this interesting class. 5 CE credits. Your instructor is an experienced, 1031 exchange facilitator in your area. 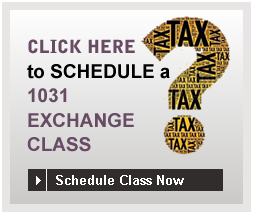 Click here for more information and to schedule a 1031 exchange class in your area. Classes available in California, Nevada and Washington.